Complete this sentence: When the weather outside is frightful… kids stuck inside are sure to be a nightmare. That’s how the song goes, right? Luckily, there are ways to wear out restless kids (and regain your sanity) without totally trashing your house — or having to get everyone bundled in Arctic-grade snowsuits to head outside. The games ahead are chock-full of hyperactivity-draining fun, and they’re a great opportunity for you to play with your favorite little snowbirds in the comfort (read: warmth) of your own home. Plus, in our experience, a little exercise works mental-health wonders for snowbound parents too. It’s literally freezing outside, so why not shake it off with a (metaphorical) freeze dance? This takes all the fun and freedom of a good old-fashioned dance party and turns it into a game the whole family can enjoy. You each take a turn DJing while everybody else dances, and when the DJ stops the music — everyone freezes. Last person to freeze is the next to DJ. There’s even a Spotify playlist to get you started. All the fun of the field without any of the grass stains. Many conventional relays and similar activities can be translated to indoor play with a little creativity. For instance, try plastic bottle bowling (with a squishy ball to preserve your furniture, of course). Or go for a hallway relay race or a beanbag toss. The possibilities are as boundless as your kids’ ever-wild imaginations. Have a couple of budding athletes on your hands? Satisfy their craving for sports with this snowy-day activity. Set up a net in your living room or basement — or anywhere you can clear some space. 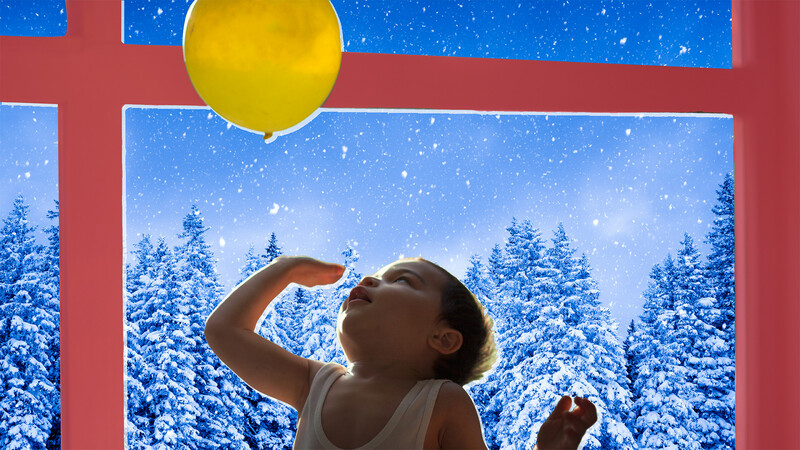 Blow up a balloon, and use it in place of a volleyball for the ultimate bad-weather tournament. Who needs the beach? What if your living room isn’t a living room at all — but a full-fledged obstacle course in disguise? It can be just that with minimal effort. Create a few obstacles, such as a limbo pole made from a broom and a row of chairs to crawl under. Add in a few heart-pumpers, like a jumping jack station or a Hula-Hoop stop. It’s sure to make bedtime go a little bit smoother. If your family is more into Downward Dogs than push-ups, you can easily orchestrate a custom kid yoga session. Plus, kids are naturally flexible, so they may find yoga even more accessible than you do. Start with a few kid-friendly poses, like Downward Dog, Warriors, Cat/Cows and Puppy posture. Write each pose on a note card and draw them at random. Make sure to woof and moo out loud at all the appropriate moments. Or you can just try one of these amazing spoof videos from Cosmic Kids. Like it or not, some kids will simply feel more engaged if there’s a screen involved — which is why we’re so thankful for active games like Dance Dance Revolution, Walk It Out, or Punch-Out. Known as exer-gaming, these programs trick — er, encourage — kids into getting off the couch and working up a sweat, all disguised as a lazybones video game. Hey, whatever works. Let kids take a trip down memory lane to revisit some of the games of your own youth. Classics like hide-and-seek, red rover, capture the flag and freeze tag are active, simple and fun — and way better than sharing your childhood nostalgia via Atari and snap bracelets. If you’ve got a really bad case of cabin fever on your hands, you may want to get out of the house for a little while. No, not skiing or ice fishing. Simply head straight to an indoor playground. These do in fact exist in many cities and towns (you can usually find one via a quick Google search). They feature tons of engaging equipment, from fanciful slides to inflatable climbing areas to ball pits. The only problem? Convincing kids to go home again. 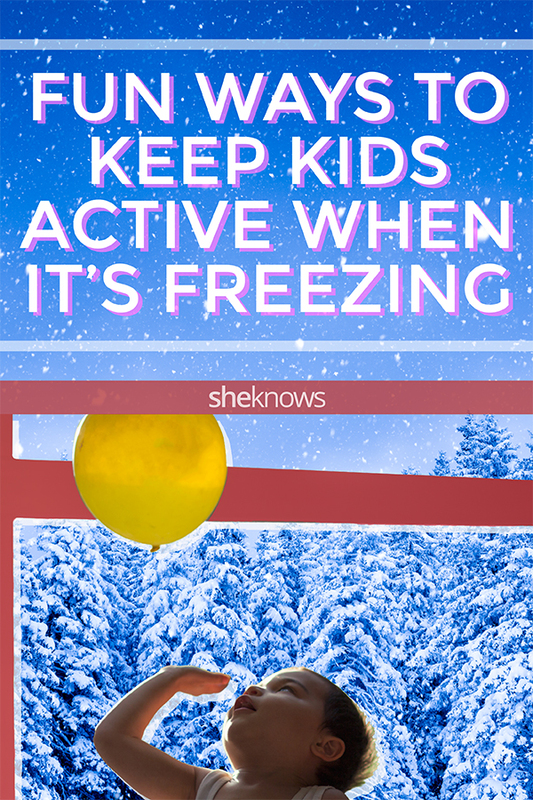 With all these ideas to choose from, your kids won’t even notice it’s dropping below zero out there. And before you know it, it’ll be April. Alysa is a certified Dallas Personal Trainer and online health coach. You can connect with her on Instagram @alysaboan.